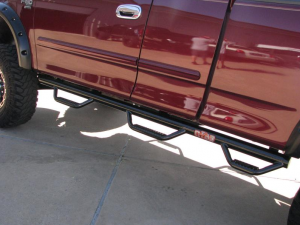 Among of the most popular truck accessories we sell at Driven Sound & Security are truck steps. 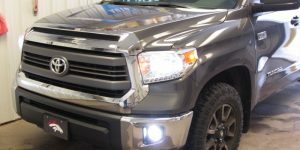 If you own a truck or SUV and live in northern Michigan, you owe it to yourself to stop by our facility and get to know us better. 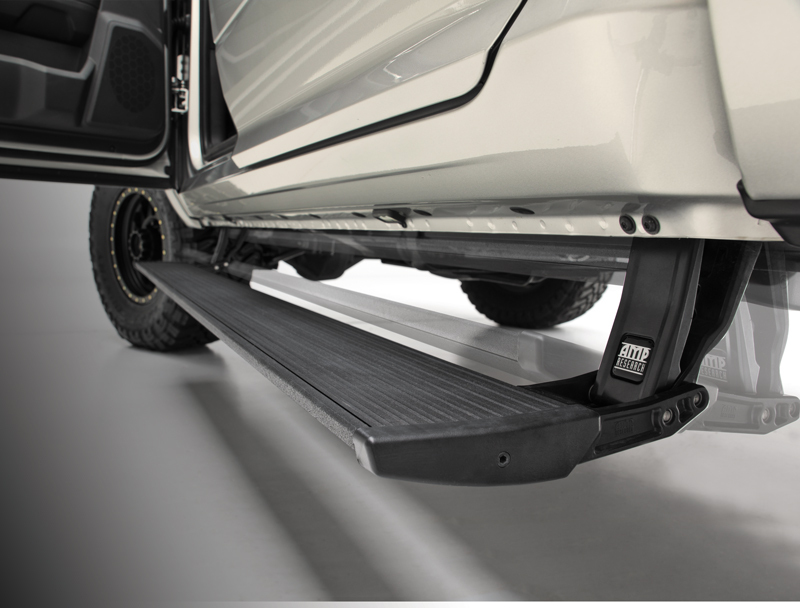 We will work one on one with you to find you the truck steps that will best fit your unique needs. Here are some of our most popular products. Power steps have continued to grow in popularity since they were first introduced. 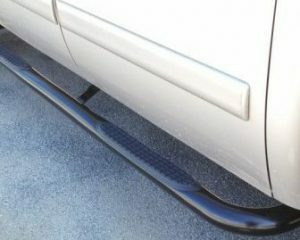 They use a relatively simple process of having a step that retracts up against the vehicle when not being used, for an almost invisible look. When you open any of the doors, the steps motorize down in less than a second and give you a secure, wide place to put your feet. 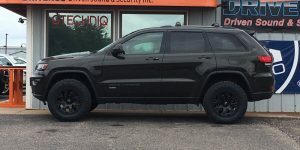 And since they are normally tucked up against your vehicle, they get less mud, snow and ice on them, giving you more confidence when you use them. After the last door is closed, they retract back up into place after two to three seconds. The icing on the cake is the integrated LED lighting that will illuminate the steps and the ground below at night. 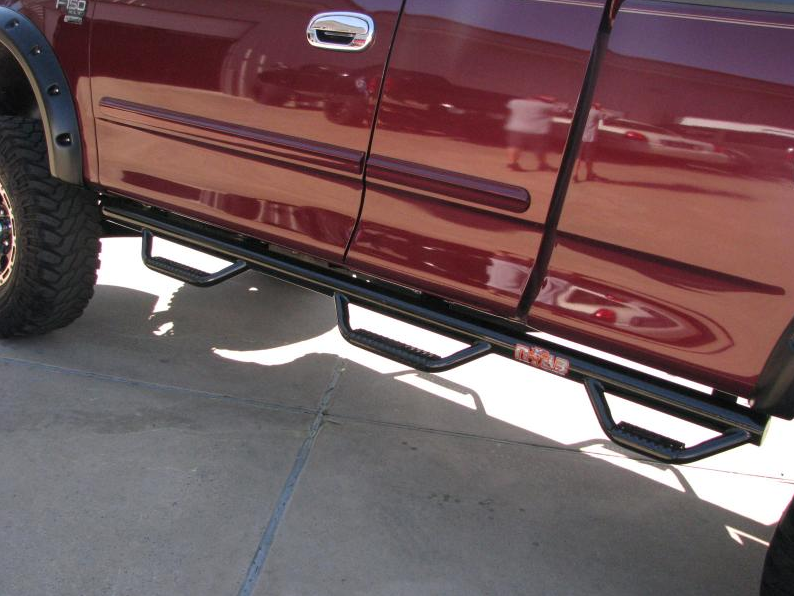 If you are looking for the ultimate in truck steps, you just found it. 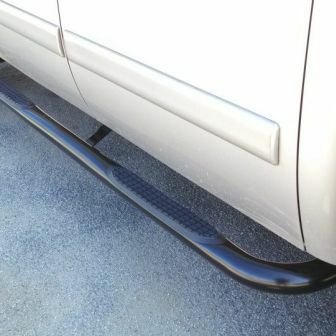 Running boards have been around longer than many of us have been alive. In the earlier days, they were made of diamond-plated aluminum, and that style is still available today. It is favored by people who truly use their vehicles like a truck, whether it be on a farm, ranch or job site. 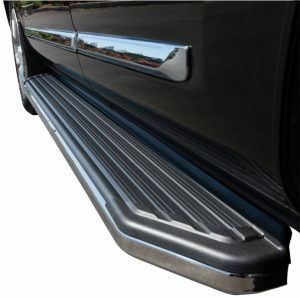 The downside to the traditional running boards is that they look out of place on modern, curvy vehicles. Now, though, you can get boards with a sleek, classy look that blends well with the body lines of the vehicle. Two of the most popular finishes are black and polished stainless steel. Nerf bars continue to morph into new styles. What started out as 3” round tubing has grown into sizes as large as 6” in diameter, with oval and square tubing also becoming popular. You can get these steps with recessed areas to place your foot near each door, or models that are flat the whole length of the bar. On SUVs, the bars will run from wheel to wheel. On trucks, they can stop at the end of the cab or go wheel to wheel, whichever you prefer. The most popular finishes are black and polished stainless steel. 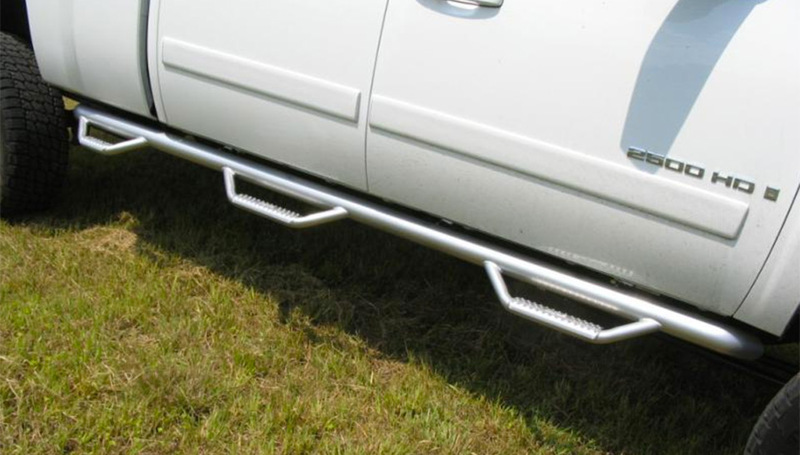 N-Fab–style steps are the next generation in style for nerf bars. Essentially, they use a round tube that tucks up tightly against the body. Integrated into these tubes are hoop-style steps at each door that extend down much farther than a typical nerf bar. They have a tough, rugged look that many people like. 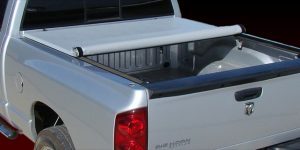 You can get them in three popular styles_ cab length, full wheel-to-wheel length and bed access. The bed-access style is unique in that it runs from wheel to wheel and adds a third step in front of the rear tire, allowing easy side-bed access. And what good is a great set of steps without proper installation? The team at Driven Sound & Security is highly skilled and expertly trained, and will do your installation right the first time. 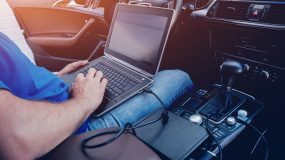 We never cut corners, since our reputation is always on the line, and we promise to treat your vehicle like our own while it is in our care. Please consider this your official invitation to stop by our facility and get to know us better. We will work with you to find the set of steps that will best fit your unique needs. You can also contact us HERE for more information about any of our products and services.